“It’s impossible!” Ever said or thought that about handstanding? Let us help you FLY! Louise will guide you through what is needed to get yourself upside down and see life from a new perspective! Learn drills and tips to develop the strength, stability and stamina that’s required for practicing handstand. You’ll find out what props can help you find lightness on the way up and feel like you’re in safe hands with our experienced instructions. 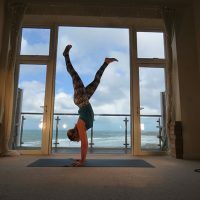 Suitable for those that are new to inversions & handstanding but must have an adventurous spirit! It’s helpful if you have a regular yoga practice but not essential. FLY into the flow as Jen leads you through creative sequences that will turn your practice upside down! Explore different techniques to kick, jump and start the work needed to press your way up into handstand away from the safety of the wall. This class is suitable for those already happy in getting up to handstand at the wall and looking to build the confidence to step away. Also for those that can comfortably hold handstand unsupported, looking to thread inversions into your flowing yoga sequences.